Ski a 9.6 kilometre groomed trail network running through the forested, rolling hills of Grey County between Owen Sound and Meaford. Enjoy the solitude and beauty of a back-country ski with the added bonus of track-set grooming for classic cross country skiing (with two sets of tracks in many areas). You’ll find a mix of trails from easy to intermediate, and while Massie Hills has its share of hills, including some steep sections, there’s nothing too extreme or too long. 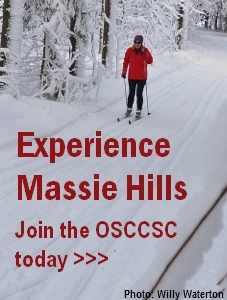 The Owen Sound Cross Country Ski Club maintains the trails on Grey Sauble Conservation property, and our dedicated groomers head out early in the morning at least twice a week – with an additional second weekend groom when Mother Nature has been extra generous. You’ll find donation boxes for day passes at either trail entrance, but we’d love to have you join us as members – ski all winter and support the maintenance of the trails by our hard-working volunteers. Please help preserve the hard work of our groomers. No snowshoeing, animals, or walking on the track-set ski trails.